It might seem incredible that anyone might believe that icon of Paris, the Eiffel Tower, could ever be for sale. But back in 1925, six people were convinced it was, and put in their bids for it with one of history’s great con men, Victor Lustig. In reality, what seems impossible to us now was actually more likely then. The Tower had only been built in 1889 for the Paris Exposition and had never been planned as a permanent fixture in Paris. By 1925 it was in a shameful state, the cost of its upkeep crippling to the city, so the idea of selling it didn’t seem too outlandish. Victor Lustig was one of nature’s con men, with a silver tongue, a convincing manner, and some ideas that, although illegal, had a touch of genius. Born in Bohemia in 1890, he first made money on transatlantic liners peddling a so-called “money-making machine” to the rich and gullible, who would give him literal fortunes – thousands of dollars – for the device, which gave out after producing $200, by which time Lustig was far away. But selling the Eiffel Tower was undoubtedly his finest hour, especially the way he approached it. Setting himself up as a fairly anonymous government official high up in the Ministry of Posts and Telegraphs, he summoned six important scrap metal merchants to a meeting at one of the top hotels in Paris, where he explained that the city could not afford to maintain the Eiffel Tower and so wanted to sell it for scrap – although everything had to be kept utterly secret to avoid a public outcry. Lustig even gave the merchants a full tour of the Tower, enabling them to see it all at first hand, before inviting their bids the following day – and reminding them that secrecy was, of course, vital. But, from early in the meeting, he’d homed in on the man he knew would make the perfect target, the insecure scrap dealer, Andre Poisson. When Poisson’s wife voiced her astonishment as to the need not only for secrecy but also for speed – just a single day to offer bids – Lustig unleashed his secret weapon, the piece that made the con so perfect. He arranged another brief meeting with Poisson and said something that made it all believable. When Lustig told Poisson his meagre government salary didn’t let him live the way he wanted, suddenly he made himself absolutely plausible. Without coming out and saying so, he’d shown that, like so many officials, he was really seeking a bribe. That touch made it all real, and erased all the doubts of Poisson and his wife. So Lustig not only took Poisson’s money for the Eiffel Tower, he also collected a handy bribe on top, and left for Vienna quite quickly. Embarrassed, Poisson could never bring himself to go to the police, luckily for Lustig, who returned to the city a month later and attempted the same trick with six more scrap metal merchants. This time, however, the police were informed, and Lustig just managed to escape. Victor Lustig worked all over, including America, where he conned the arch-gangster Al Capone out of $5000 – a remarkable and daring feat, given the man’s deadly reputation. Eventually arrested in the US in 1934 for counterfeiting, he escaped, was re-arrested and died in jail in 1947. 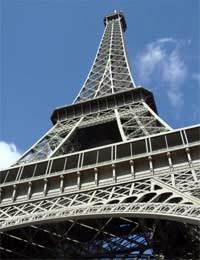 Do you think Victor Lustig had remarkable persuasive powers to convince six good businessmen that Paris might really sell the Eiffel Tower? Did the idea of wanting a bribe really make him seem more believable? What did he appeal to in the businessmen – greed, profit, the idea of status, or a mixture of the three?